Have you heard the news? 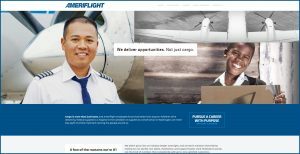 Ameriflight has rebranded! Over the past few months, we’ve been planning, drafting, and working hard to rebrand Ameriflight. We’re excited to announce that we’ve launched our new website and tagline and are in the process of rolling out the rest. We feel strongly that these changes will help keep Ameriflight ahead of the industry and top of mind. When we started the process of choosing a new tagline, we had two points of criteria. We wanted it to 1. showcase what we do bottom line, and 2. showcase what we do when you zoom in a little closer and take a hard look at the behind the scenes. Delivering More Than Cargo does just that. Sure, we fly boxes, but behind every package is a person, and behind every person is a story. And at Ameriflight, it’s our job to deliver those packages and be part of that story. Whether that’s a birthday gift, time-sensitive live-saving medicine, or an overnight care package, at Ameriflight, we truly are Delivering More Than Cargo. Visiting our website, you’ll notice a pretty significant change in look and feel. We’ve wrapped in our Delivering More Than Cargo concept and included more photos of employees doing what they do best. We wanted to present something more clean, modern, and inviting to our current and future employees and customers. Something that would make it clear what Ameriflight is really all about. If you click through the site, which we highly encourage you to do, you’ll notice that it’s more user friendly and interactive. Our hope is to keep Ameriflight ahead of the industry, stay on the radar of current and future customers, and encourage more smiling faces to join our team. And the rebranding doesn’t stop there! Our social media is getting a face lift as well. Follow us on Facebook, Twitter, Instagram, and LinkedIn to see for yourself. Keep an eye out for more graphics, employee photos, and maybe an occasional give away. We want the world to see what amazing things our Ameriflight employees do every day. We hope you like the new Ameriflight brand! We sure do!